♦ What is an Apparatus? And Other Essays, Giorgio Agamben, Stanford University Press, 2009. 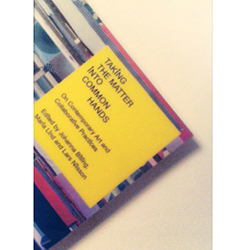 ♦ Taking the Matter into Common Hands: On Contemporary Art and Collaborative Practices, eds. Johanna Billing, Maria Lind and Lars Nilson, Black Dog Publishing, 2007. ♦ The Practice of Everyday Life, Michel de Certeau, University of California Press, 1984. ♦ The Third Hand: Collaboration in Art from Conceptualism to Postmodernism, Charles Green, University of Minnesota Press, 2001. ♦ Spatial Aesthetics: Art, Place, and the Everyday, Nikos Papastergiadis, Rivers Oram Press, 2006. Text: (Collaborating) Here. Right Now.